In the UK 127,000 people are diagnosed with Parkinson’s disease, many of whom are frequently admited to hospital. However, Parkinson’s disease is not usually the primary cause of admission. 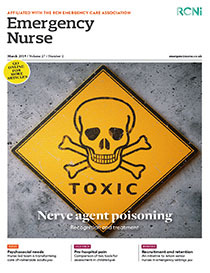 Emergency department (ED) nurses must be aware of the medication needs of people with Parkinson’s disease and how these can be met in emergency setings to ensure the stability of their condition and to prevent the development of neuroleptic malignant syndrome, a potentially fatal condition caused by abrupt omission of Parkinson’s medication. This article highlights the importance of ensuring that patients with Parkinson’s disease continue their medication regimen while in an ED, even if they are temporarily unable to swallow, and uses a case study to illustrate various ways of achieving this.